Hello you lovely lot and welcome to this weeks Read With Me. I've been picking different genres and authors to read recently and it got me thinking, do you tend to stick to what you know when it comes to books or are you happy to give anything a go. I'm willing to give anything a go but I can't promise to see a book through to the end if it doesn't grab me, I recently heard of rule, I can't remember exactly how many pages it said but it was of the understanding that if you got to this certain page and the book hadn't caught your interest then it probably wasn't going to. I normally give it to around 100 pages. My reading pace has slowed slightly these past couple of weeks. I recently finished Alexandra Burt's Little Girl Gone as well as finishing Pretending to Dance by Diane Chamberlain, both very interesting in different ways but each containing that air of mystery. The post which I picked as my favourite this week comes from Yet Another Mummy Blog with her review of Missing Presumed, the fact that she was sent a stiff drink to help her along with her reading, I feel this is something I now need to read! Onto this weeks link up. If you are new please check out the Read With Me page to see what it's all about. Link up a max of 2 posts or videos and please comment on a few others. Also appreciated if you display my badge. I'm happy to try different genres, although I won't touch fantasy or science fiction and I gave up chick-lit a few years ago. I've never once given up on a book! Hello Chantelle! I hope you're having a great Monday so far. 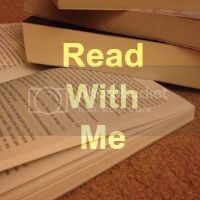 Thanks for another week of 'Read With Me'!